Monday night: Chance sprinkle, lows around 40. Tuesday: Cool and cloudy, late showers. Highs only in the 40s. Clouds, drizzle and cool temps will remain in the forecast through Wednesday for southern New England. A couple more showers roll through southern New England this evening, otherwise patchy fog & sprinkles. Northern New England continues to see a mix in the mountains, to snow in Maine through tonight. The northeast is experiencing quite a spread in temperatures, too! Overnight lows in the 20s in the north country, around 50 across Connecticut. Black ice will be an issue across Maine, New Hampshire and some parts of Vermont through Tuesday morning with a few snow showers lingering into Wednesday. Meanwhile, in Rhode Island, Massachusetts and Connecticut, we see more overcast, drizzle, an onshore wind and temps stuck in the 40s for most (low 40s along the coast) Tuesday. 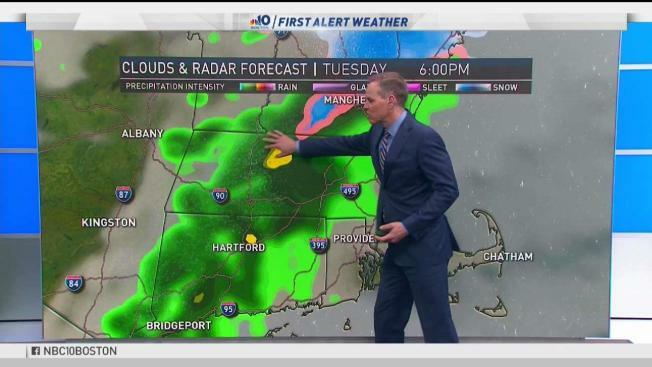 Showers develop and move through by Tuesday evening. Damp enough of a day to make it uncomfortable for the Red Sox home opener at Fenway Park, but we should hold off on the steady rain and downpours until evening. The clouds slowly erode away late Wednesday, giving us sunshine Thursday and early Friday. Highs increase from the 40s Wednesday, to the low 50s Thursday and near 60 Friday. Watching a powerful storm develop across the Great Plains this week and expecting that to affect us Friday night. Scattered rain will be likely Friday night into early Saturday, but we may luck out again and dry off Saturday afternoon and watch temps climb into the 60s both Saturday and Sunday across the interior. Sunday into Monday we cool off as a system passes to our south. Tough to pinpoint exact timing or rain totals for Marathon Monday, but plan on some rain and cooler temps. Stay tuned!